Howdy! Thanks for dropping in today to see what’s new at Flawed yet Functional. I am a Type 1 Diabetic managing my blood sugar levels through diet, exercise, and healthy habits without additional insulin. 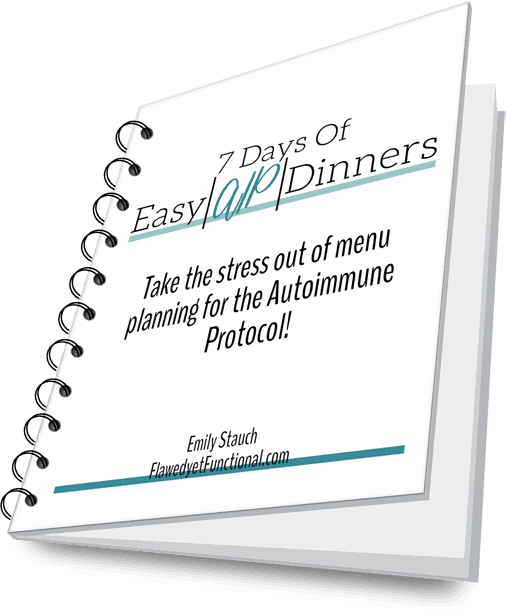 Through an elimination diet called the Autoimmune Protocol, I’ve been able to identify the trigger of my autoimmune disease (gluten) as well as other gut irritants (dairy and eggs, so far!). While it might seem like I have nothing to eat, I assure you my diet is not only varied but extremely satisfying. Today, I’d like to show you my essentials for an AIP or Paleo pantry to give you ideas for alternatives if you are thinking of walking down the AIP or Paleo road. Baking is not something that is a daily or weekly event in my house. Processed food, even when processed by me, is not handled well by my body. My pancreas is roughly 80% dead so sweets and highly processed flours (even gluten-free ones) are rough on my blood sugar. That being said, I try to make treats for my family every now and then so I do keep some Paleo-approved baking items. Non-gluten baking items spoil very quickly, so my list of necessary dry good is broken down into ones that are shelf stable and ones that are kept in the freezer. Oils and fats are a staple in the AIP and Paleo diets. They make a meal more tasty and satisfying and keep you full longer. I use oils and fat daily, liberally. Vinegars are used a couple times a week as a meal calls for it. My husband and I were avid cooks before beginning this healing through food journey. Because of that, we have a lot of spices. I’m sorry, I meant to say A LOT of spices. The picture below is about half of what we own. Some are in large containers in another cabinet and the infrequently used ones are in the freezer. The ones listed below are used daily or weekly, and I’d consider them bare minimums. This segment is such a tough one to handle for those switching from the standard American diet. Basically everything in the snack aisles at the grocery store is off limits. So what does one snack on??? Below is my short list of go-to’s, and yes, it is short. Can I tell you a secret? If you are feeding your body properly at meal time, you don’t need to snack (If you’re an adult.). Gasp! Not snack??? Did I lose some of you there? What I’m saying is true, but don’t take my word for it. Try it for yourself. Change your diet, and see if your urge for snack is still present. That being said, this is my list of go-to’s when I do need something in between meals. Chocolate chips (AIP reintroduction) – gluten, dairy, egg, and soy free – I usually buy these or these. 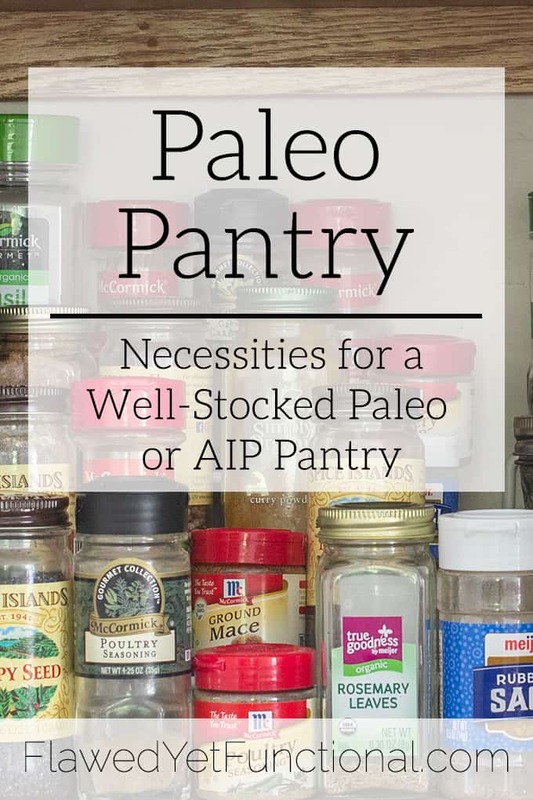 A Paleo pantry (or AIP) is much simpler than a typical American pantry. There’s a beauty in simplicity though. 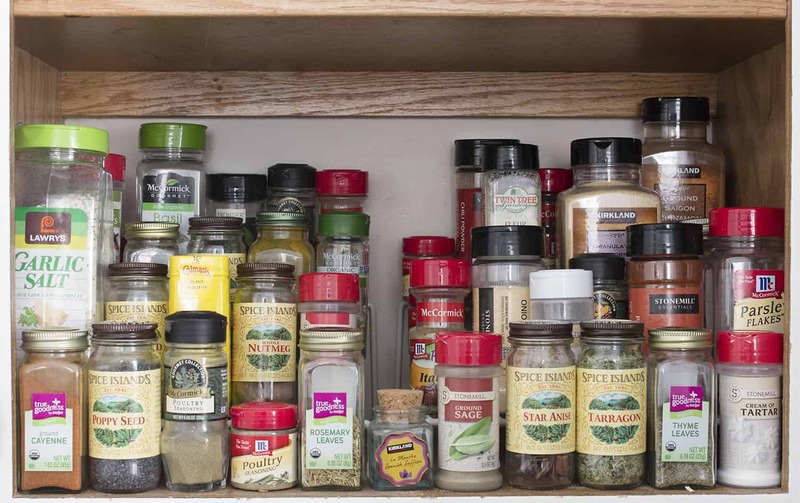 Many, many dishes with a wide variety of flavors are possible with this concise pantry. Are you dabbling into the land of Paleo or AIP? What concerns you the most when it comes to stocking your kitchen?